The trustees met in JSU Stadium on July 16-17. Photo by Matt Reynolds. 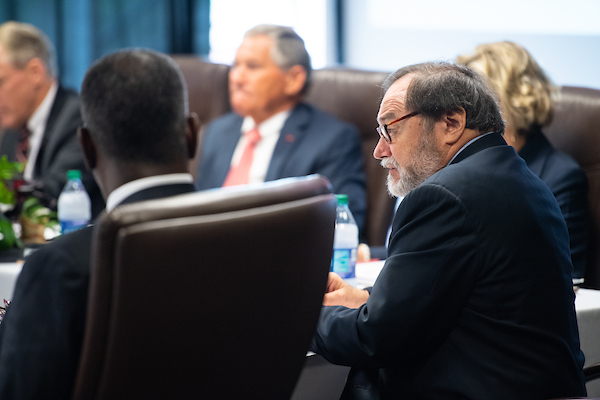 The JSU Board of Trustees held its summer meeting at JSU Stadium on July 16-17. It was the first official meeting of new SGA President Kasey Gamble and Faculty Senate President Patrick McGrail in their new roles. Jim Brigham was confirmed by the board as the university’s new vice president for finance and administration. The board was also introduced to Staci Stone, dean of the School of Arts and Humanities; Skip Clark, chief internal auditor; Todd Garvey, volleyball coach; and Kandace Hamilton, director of diversity and inclusion. The board formally thanked RMC for donating a hospital to the university and voted to give President Beehler the authority to continue to negotiate the agreement. The board voted to give President Beehler authority to negotiate the purchase of a warehouse on Roy Webb Road. Agreed that the donors who have helped fund the renovations of the Gamecock baseball stadium would have naming rights and announce the name of the facility at a dedication this fall. Announced that construction of the new wellness center was on budget and ahead of schedule, with plans of opening in January. Passed a resolution asking the City of Jacksonville to place a temporary, 18-month moratorium on its housing ordinance (which limits roommates to two unrelated persons per household) until off-campus apartments destroyed by the March 19 tornado are rebuilt. The board will meet again on Oct. 15-16.